* Only Breeder Members of RFCI may submit an Available Kitten/Adult ad. * Adult listings are not done on a daily basis but published when there have been other submissions. Please be patient once your submission has been sent in and allow time for listings to take place. 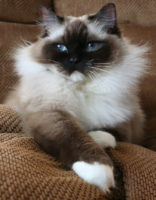 Only registered blue-eyed pointed Ragdolls may be listed. * One ad/picture per adult cat every 30 days will be allowed. Adult listings will be removed after 30 days. PLEASE NOTE: RFCI breeder members do sign a Code of Conduct to qualify for membership. However, we make no representations or warranties with respect to the breeding or business practices of any of the persons included on the RFCI website. Please check out breeders thoroughly before making a purchase. 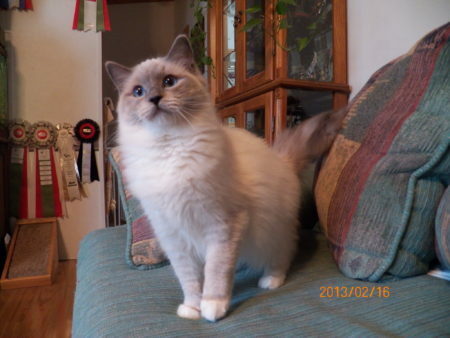 Notes: Bliss is an extremely affectionate Blue Mitted female. She can not get enough attention and kneads and purrs nonstop. She would do best as an only cat but might except a kitten once settled. She is up to date on vaccines & worming and is spayed. Notes: Mardi is a seal mitted female that is up to date on shots and has been spayed. She would do well with a male adult cat or kitten of either gender. She would do well being shown in the Alter class (TICA) and something to consider but not required. We will drive up to 2 hours to meet the right family or person. Please visit www.keepurrs.com to fill out our Kitty Application if interested. Thank you.